Memorial Day weekend is coming our way, and with it brings the start of concert season! 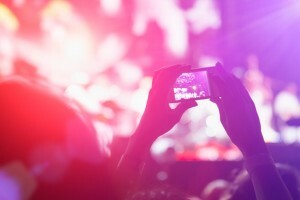 If you’re attending a concert in the coming weeks, you’ll want to capture every moment of this once-in-a-lifetime experience. To help you take some memorable shots, we pulled together some of our best tips on how to take great concert photos. Depending on the lighting, you’ll need to adjust the camera’s settings accordingly. For example, If it’s an indoor or night concert, you’ll want to set your ISO high, whereas a bright, outdoor performance will require a much lower ISO. Not sure which camera setting is which? Check out our article, De-Coding the Language of Camera Specs: 5 Key Terms to Know. The performers on stage are usually in a constant state of motion, so catching them in a cool pose can be tricky. Keep your camera at the ready, and study their movements to see if you notice a pattern. When you think the perfect pose is coming up, get your finger on the trigger! If your psychic powers aren’t working, set the camera to burst mode. This will help you take several pictures at once, increasing your odds of snagging a stellar photo. There’s a tendency at concerts to make the lead singer the focal point, placing them smack-dab in the middle of every shot. Switch things up by off-centering your frame—it could create interesting contrasts and show more of the entire concert experience. While the lead singer naturally attracts a lot of attention, there may be a better shot sitting right next to you. This is your chance to get artistic and take photos of the moments that other attendees may overlook. While you should absolutely take tons of great photos, make sure you spend enough time away from the camera to really live each moment outside the lens. This entry was posted in ScanMyPhotos News, Uncategorized and tagged cameras, digital photography, digital photos, photo tips by Monika Jansen. Bookmark the permalink.